Flavor is the very essence of fine baking, the source of wonderful tastes and aromas that tempt the palate and delight the senses. 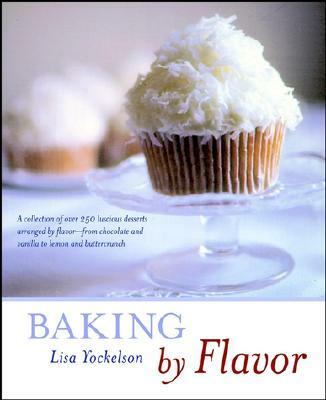 In Baking by Flavor, Lisa Yockelson shares flavor-boosting secrets that can make virtually any recipe burst with new vigor and freshness. This book reveals concepts and techniques for using eighteen basic ingredients-including chocolate, vanilla, apricot, and lemon-to "pyramid" flavor, layer by delicious layer. Two hundred and sixty carefully selected recipes inspire readers with ideas for animating many "old favorite" recipes that may have become more "old" than "favorite." For example, a dormant pound cake springs to life as the author scents sugar with vanilla, creams butter with vanilla bean scrapings, and beats egg yolks with a double-strength vanilla extract . . . dark chocolate brownies become richly sensuous as chopped nuts, lightly coated with cocoa powder and confectioner's sugar, are added to a creamy batter. Clearly written, easy-to-follow instructions make the book a joy to read and use in the kitchen, while 118 photographs give visual expression to techniques and eighteen color-plated presentations. LISA YOCKELSON is a baking journalist who concentrates on both classic and contemporary American and European regional baking specialties. Her extensive research in flavor-accenting baked goods, on which this book is based, has continued for more than a decade. Over the years, her recipes and articles have appeared in numerous national food and home-related magazines, including Cook's Illustrated, Chocolatier, and Pastry Art & Design, and she continues to contribute to the food pages of The Washington Post, where her work has appeared since 1984. BEN FINK, a New York City-based photographer, studied painting and graphic design at Memphis College of Art, and then translated those disciplines into capturing images on film. His work in food photography unites elements of classic design, light, and texture by creating pictures of food that are at once reflective and poetic.